Dog joint pain is common, especially in older dogs, and is often caused by osteoarthritis. But sometimes joint pain in dogs can be caused by other health issues (e.g. hypothyroidism), so if your dog shows signs of joint pain, be sure to get a proper diagnosis so that timely treatment can be given to your oldie. 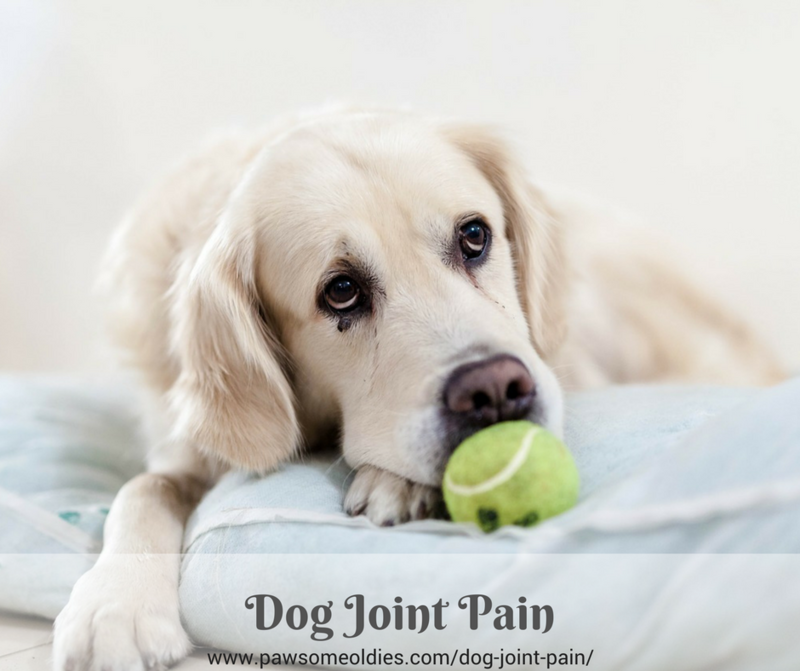 This post takes a look at some possible causes of dog joint pain, and some of the signs that show a dog is having pain in his joint(s). Soft tissues are made up of the ligaments, the joint capsule that surrounds a joint, and the muscle-tendon units. Hard tissues are made up of cartilage and the bone underneath it. Joint fluid is the “lubricant” for the joint and carries nutrients to the cartilage. It is mostly made of water but also includes important elements such as hyaluronic acid (HA). HA makes the joint fluid thick and provides lubrication. Perhaps the most common cause of joint pain in old dogs is osteoarthritis. Bone spurs that grow around the joint. Osteoarthritis occurs rather commonly in old dogs. Depending on the age and how serious the problem, there are several treatment options for osteoarthritis in dogs. I have written an “Ultimate Dog Parents’ Guide to Arthritis in Old Dogs”. Check out the articles for more information. Spinal diseases such as disk herniation can cause back pain and eventually joint pain in older dogs. The spinal vertebrae, due to age or trauma, can degenerate, resulting in herniation or ruptures. When that happens, nerves in the spine are affected. The result? Back pain. But that’s not all. Joints in the legs can also be affected. Because of back pain, the dog’s gait, “walking style”, and range of motion will change as well. The dog may move the joints in a different way in an attempt to lessen the back pain. Over time, this can lead to joint pain. Hypothyroidism causes an array of symptoms, and one of them is joint pain – sometimes severe. Older dogs are prone to hypothyroidism, but they are also prone to arthritis. So, very often, when an older dog walks with a limp and appears to have joint pain, many dog parents and even vets would assume that it’s age-related osteoarthritis. That’s why many cases of hypothyroidism in older dogs are misdiagnosed as arthritis. Other symptoms of hypothyroidism include recurring skin and/or ear infections, hair loss, weight gain, cold intolerance, and lethargy. If your old dog has started to walk with a limp, AND shows some of these symptoms, be sure to get your vet to do a blood test to determine her thyroid hormone level. There are different types of cancer in dogs. One that affects a dog’s joints is called synovial sarcoma. This type of canine cancer affects the soft tissue around the dog’s joints. Synovial sarcoma is rare in dogs, but when it occurs, it could be deadly because it is very aggressive. 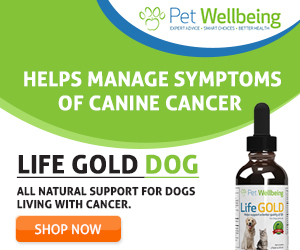 At the onset of this cancer, the dog may start showing symptoms similar to those of arthritis, such as limping, appetite loss, and reluctance to play, and so on. Once again, this shows how important it is to get an early diagnosis – especially if cancer is suspected! If a dog has synovial sarcoma, early diagnosis and timely treatment is necessary to get rid of the tumor. 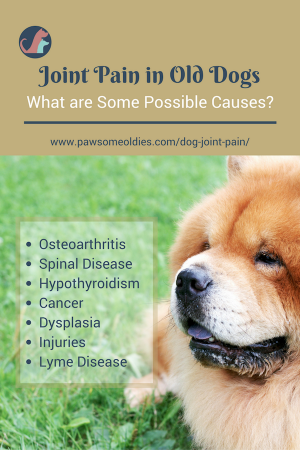 What I talked above are the most common causes of joint pain in older dogs. In dogs, “joint abnormal development”, such as hip dysplasia and elbow dysplasia, is rather common and can a lot of joint pain in dogs. Hip dysplasia is the abnormal development of the hip joint, and elbow dysplasia is a group of diseases all related to the abnormal development of the elbow joint. Hip dysplasia is more prevalent in certain dog breeds, such as Golden Retrievers, Labrador Retrievers, German Shepherds, Great Danes, and Rottweilers. A dog with hip dysplasia, who shows little or no sign of symptoms when young, may develop osteoarthritis as he ages due to damage to the cartilage in the hip joint. Injuries such as bone fractures (especially those occurring close to a joint), and torn ligaments or tendons of the knee can also cause dog joint pain. One common and painful case of torn ligament is a tear or rupture of the anterior cruciate ligament (ACL). A dog with a torn ACL will go lame in the affected leg and most likely won’t let you touch that limb! X-ray is necessary to see if surgery is needed to repair the ligament. Lyme disease is a tick-borne disease that can cause swollen joints and lameness in dogs. Other symptoms include high fever (103°F; to 105%deg;F), appetite loss, lethargy and swollen lymph nodes. Unlike humans, who show symptoms of Lyme disease soon after a tick bite, dogs can take up to 2-5 months before showing any symptoms. Lyme disease in dogs is treated using antibiotics, which must be given for a minimum of 2 to 4 weeks. The best way to prevent Lyme disease is of course tick control, such as checking for ticks on a dog’s body and immediately removing them from the dog, as well as using tick repellents on the dog. It is not hard to recognize the signs and symptoms of dog joint pain. The most obvious sign is lameness, which means the dog is not using his legs properly, like limping. The mere fact that he is lame or limping means that he has pain. Limping is an attempt by the dog to lessen his pain by changing the way he walks. You can tell your dog has lameness in his front limbs by the “head nod” while walking. He lets his head drop down when the healthy limb hits the ground and throws his head up when the sore limb strikes the ground. This way, he is trying to lessen the weight he puts on his sore limb. Lameness of the hind limb is a bit harder to see. You may see an increased “hip sway” (hip moving from side to side) by your dog while walking. He may also drop his head and extend his head forward to try to shift weight to the front limbs. Your dog may also drag his back feet while walking. When standing, your dog will shift his weight to the healthy limb so you may see an abnormal posture. It’s of course not easy to prevent joint pain, either in ourselves or our old dogs! No one can stop aging! 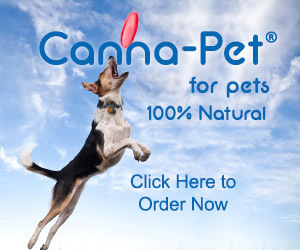 But, we can do a few things to minimize or slow down the onset of dog joint pain. For example, we can prevent our aging dogs from gaining weight. We can keep our oldies active by exercising them regularly. Giving them joint health support supplements such as glucosamine and Omega-3 fatty acids is another way to keep their joints healthy longer. Finally, the saying, “when in doubt, check it out!” sums up succinctly about what we should do when we are not sure why our golden oldies are limping and seem to be in pain. We shouldn’t try to guess what’s wrong. Instead, we should take the dog to the vet.